I thought I had already mastered pancakes with this recipe a few years ago, though, turns out I wasn't even close. As the name says, these are fluffy, soft and I cannot believe they are healthy. There are no carbohydrates at all, which makes them a perfect breakfast option. I serve them with homemade coconut yogurt and fresh or thawed organic berries. Seriously delicious. 1. Whipping egg whites; this step is optional, though allows for extra, extra fluffy, soft pancakes. If you cannot be bothered, or don't have the utensils, just combine all of the ingredients well and then follow on from step 4. Once your eggs are successfully separated, place the egg whites in a clean, dry bowl that will allow you to beat them with a whisk. You need to beat them until they are a firm foam. I use my Thermomix for this, with the butterfly inserted, on speed 4 for 2 minutes. Otherwise, see this video to be taught how to do this by hand! 2. Sift the coconut flour and bicarb into a separate bowl, and then add the remaining ingredients including the egg yolks and mix well. 3. In batches, gently scoop the egg whites into the wet mix and gently fold them through till well combined. Be patient and gentle to avoid the bubbles in the egg whites diminishing. 4. Heat up a pan with your chosen fat, and then cook pancakes as usual, until just a few bubbles come through and is golden. 5. 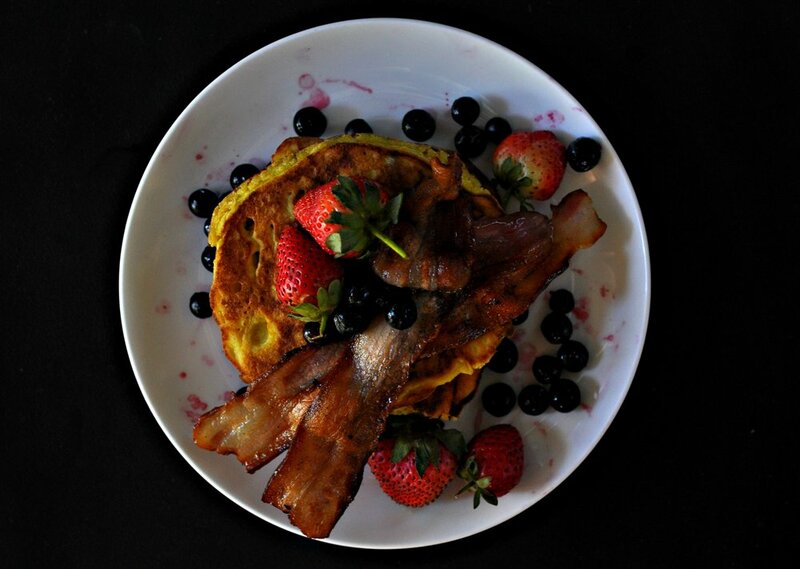 Enjoy with fresh berries, coconut yogurt, cinnamon, maple syrup or what I did, was chemical free, organic bacon. HEAVEN.